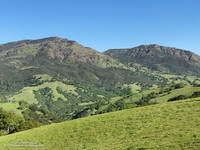 This is a view of East Las Virgenes Canyon from the power line service road that connects the Las Virgenes Canyon Trailhead to Cheeseboro Ridge. 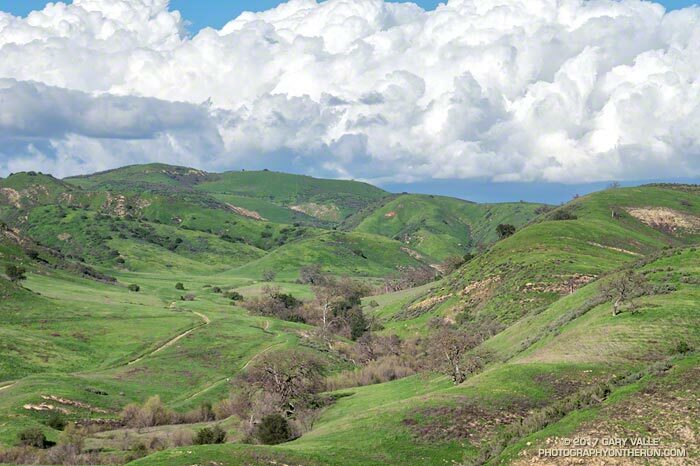 East Las Virgenes Canyon is part of the Upper Las Virgenes Canyon Open Space Preserve (formerly Ahmanson Ranch). From this afternoon’s keyhole loop run from the Victory Trailhead to Cheeseboro Ridge. 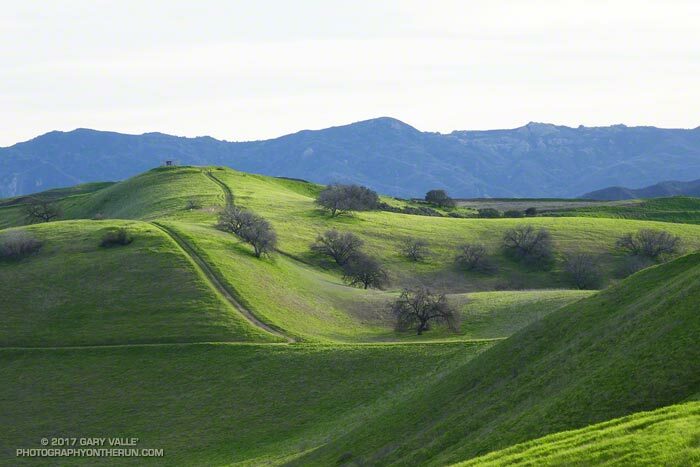 Green is what you get when so much rain falls on a valley oak savanna. 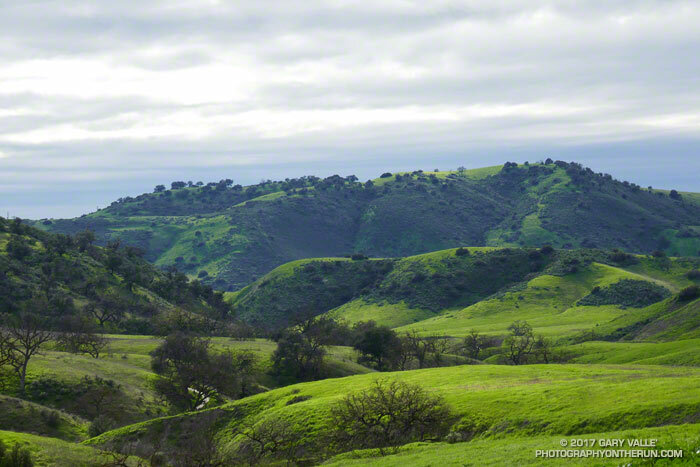 This is a view west, down East Las Virgenes Creek, toward Las Virgenes Canyon. The ridge in the distance is between Las Virgenes and Cheeseboro Canyons. From Sunday’s run to Temescal Peak and through Garapito Canyon. Race director Nancy Shura-Dervin picked a great year, and as it looks now, a great weekend for the inaugural running of the Ahmanson 12K Trails event. 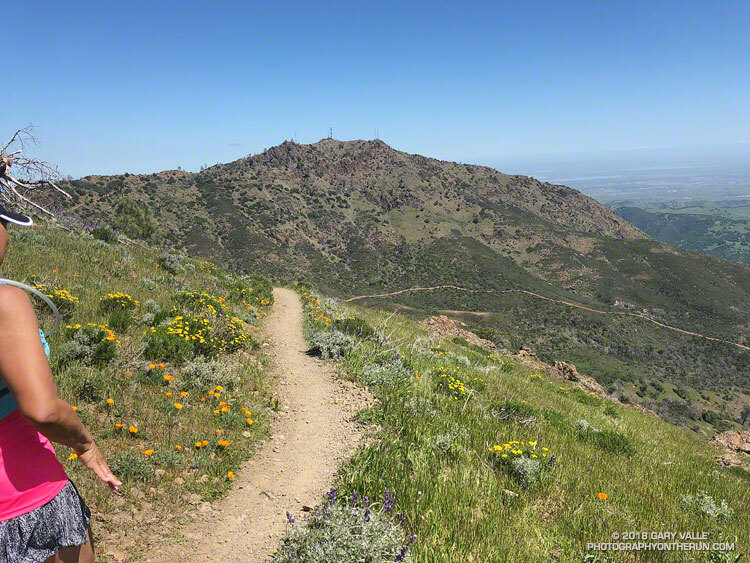 The hills are lush and green; wildflowers are in bloom; valley oaks are sprouting fresh green leaves; and it’s looking like race day may be one of those “gotta run” kind of days. According to today’s NWS forecast the area will see dry and warmer weather beginning Tuesday and continuing through race day. While there could be a remnant puddle here or there, four days will be plenty of time for the dirt roads to (mostly) dry out. The Cheeseboro RAWS automated weather station can be used to get an idea of the current weather in the vicinity of the race course. 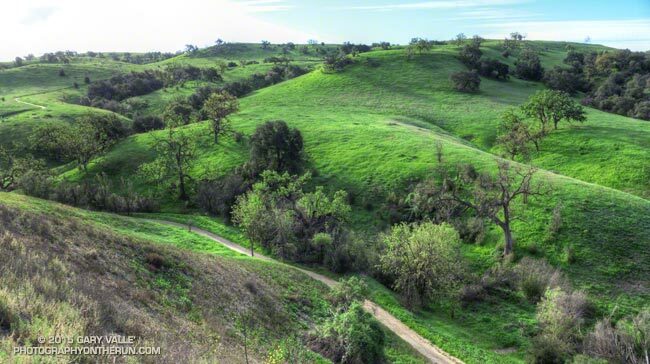 Over the past 10 years I’ve logged approximately 6000 miles at Ahmanson Ranch (now Upper Las Virgenes Canyon Open Space Preserve) and the loop Nancy has selected for the course is a variation of a favorite. Lasky Mesa has long been used to shoot movies, television, commercials, music videos, and even Internet games. 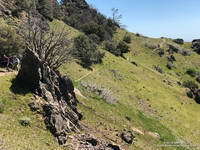 Its wildland character and expansive views bely its urban location. For a few weeks one summer the Mission Impossible III bridge was a Lasky Mesa landmark. The aesthetically-shaped valley oak at the west end of Lasky Mesa is a favorite of production companies and I’ve spotted it in more than one commercial. The Ahmanson 12K should be an outstanding event on an excellent course in conditions we haven’t seen at Ahmanson in several years. 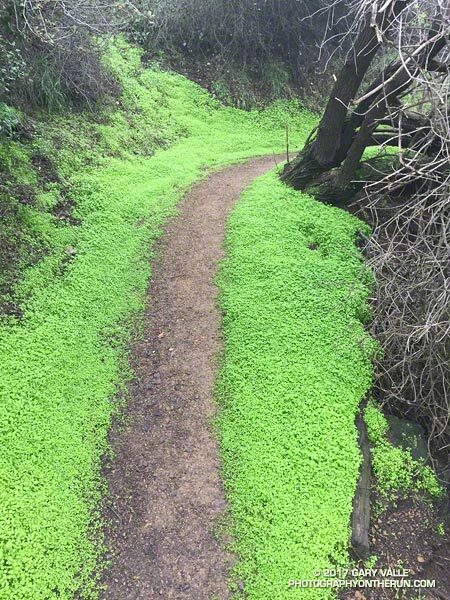 For more information and photos see the Trail Run Events web site and the Upper Las Virgenes Canyon Open Space Preserve web site.